why can’t pumpkins be seedless? 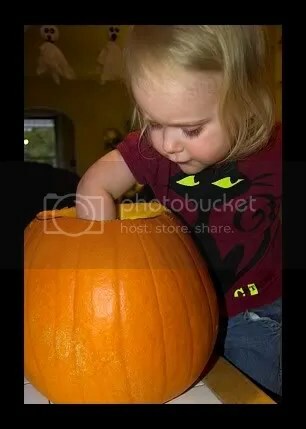 This weekend SuperPuff had her first experience with carving Jack o’ Lanterns! We WERE gonna go to the pumpkin patch and let her pick a super-special one, but it rained the whole weekend through so we never made it. Still, good old grocery-store pumpkins do just nicely for this kind of thing, even if they’re a *bit* more hypocritical than Linus would have allowed. 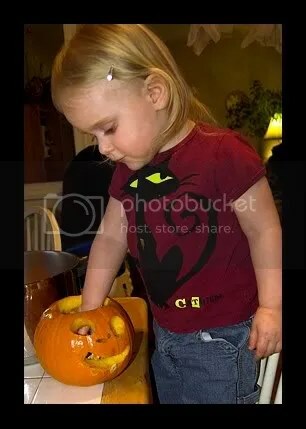 She didn’t get to do the actual carving, of course – thats Daddy’s job. But I really wanted her to have some say in the design. So she got a brush-full or our homemade black paint, and painted faces on her soon-to-be Jacks. She rocked it, of course. For those of you who don’t know that Puff can draw (and paint) faces (or things that vaguely resemble faces) you can read about it and see her first ones here. I must admit, I’m still impressed every time I see her do it. . .and she gets all proud of herself, too! Pumpkin number one, I was told by the artist herself, is a scaredey-face pumpkin. Which explains why he has such a big open (screaming) mouth. Puff also painted him a tear. . .I guess that makes him a sad one, too. 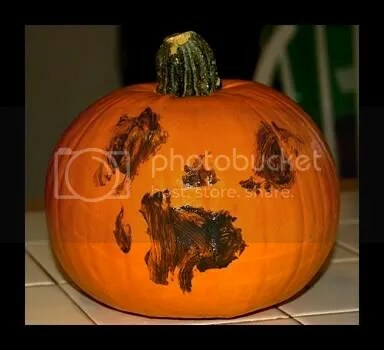 Poor pumpkin number one! I’m glad that Puffy didn’t feel like Pumpkin number one. 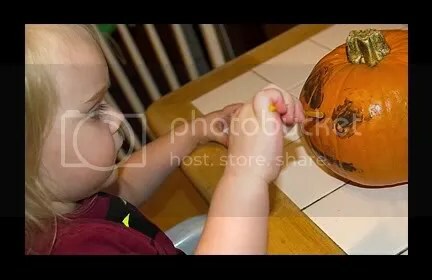 She was actually thrilled to be painting her pumpkins – though she may have been just a little bit confused by the whole thing. Because, ‘come on! Painting and cutting pumpkins is a pretty weird way to spend an evening with the fam, dontcha think? Lets just chalk this one down to another one of those inexplicable things that grown-ups do. 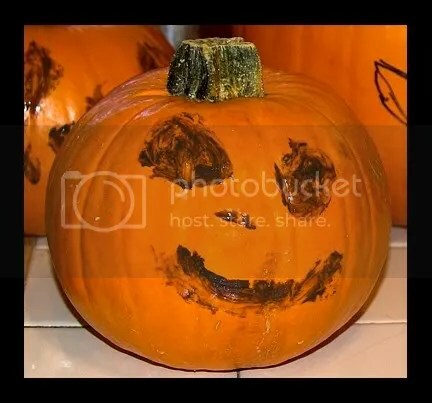 . .
Pumpkin number two was a happy little pumpkin, all painted up with a big ol’ Jack o’ Lantern grin! Next step was to scoop seeds and strings out of all pumpkins, large and small. The thought had crossed my mind to cook the seeds up, but after seeing the huge pot of pumpkin gunk from all four pumpkins, I lost all motivation. They’re in my fridge still. . . Just in case I change my mind. . .which I doubt. The novelty of scooping pumpkin innards wore thin after the first 3 were done. Puff shows us her pumpkin’s guts. 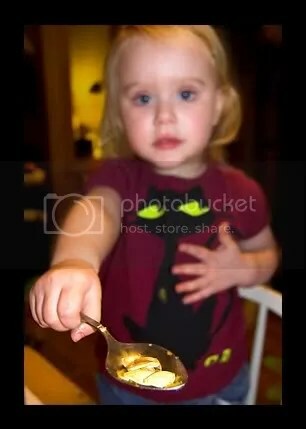 . . mom takes a picture of the spoon, per Puffy’s request, but is really looking at the slime-wiping hand. . .
Daddy carved ’em up, trying to stay true to her designs, and here are the finished products! Presenting Puffy’s first Jack o’ Lanterns! The whole pumpkin family. 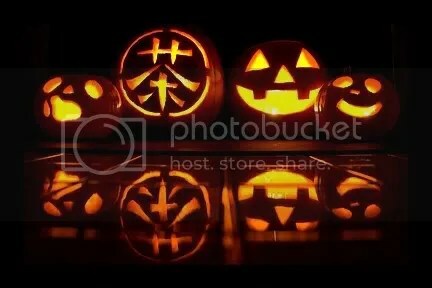 . .
Daddy’s pumpkin is carved with the Kanji symbol for tea – a favorite obsession of his. I chose a very traditional Jack design, cuz’ I figured there should be at least one in the bunch. But then there was the gourd. 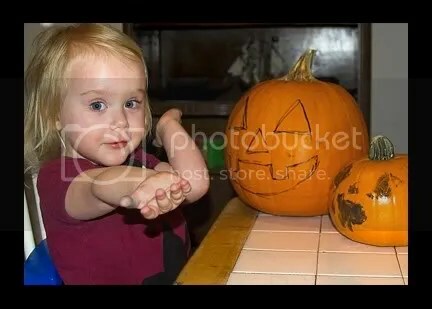 You can’t carve a gourd, but. . .there it was. Begging for attention, as gourds are known to do. So Puff painted on a face. And glued some googles on. Then she demanded a yellow triangle nose – but after seeing it in action, decided that blue would be better. 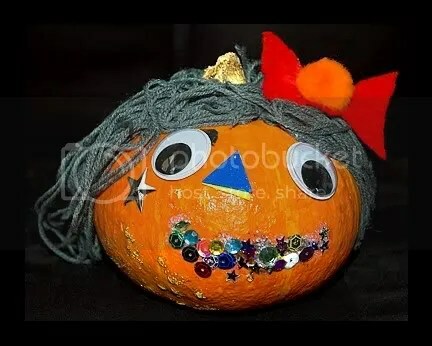 It was then determined that the gourd needed to have green hair, a red hairbow, and an orange puff on top. . .and obviously she needed a mouth. First, Puff tried puffballs for the mouth, but they kept falling off, so she ended up using tiny gems, glitter, and sequins instead. A silver star as the finishing touch, and there it was. The gourd is now known as Gordelia Glam, and lives on our table. . .because such a glamorous gourd simply can NOT be expected to sit on the stoop with the pumpkin fam. THAT would never do. . . But then, Teagle always has been a fan of pumpkins. What a testament to this whole ritual. Love the sequins and sparkles. And I cook the seeds because that is the only reason I do all this year after year. No one has ever lasted long enough to do the whole carving slime clean up thing. It’s a silly chore that I got all Martha about for a few years. Now… grocery store , and paint ! 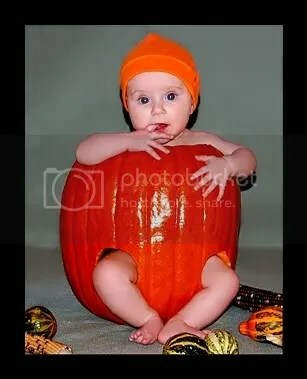 I really love that picture of your baby inside the pumpkin! That is so cute!! Awww!!! Miss T has done very well with her pumpkins. They turned out well after carving. 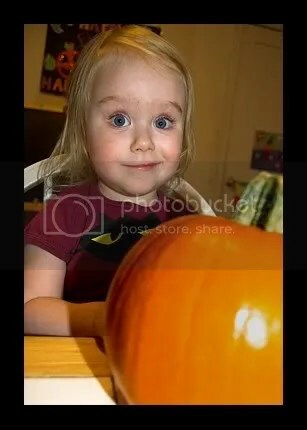 Those are some great pumpkins. My hubby has to always do one that is over the edge too. Deb – Ritual is right! I ended up tossing the innards. I just couldn’t bring myself to get all slimed up again! Wecki – You totally should! Tor would LOVE it – and you’d have fun, too! But I wouldn’t say she’s ‘missing out,’ as long as she does it by the time she’s five, she’ll never know any better! Nikii – *giggle* Yeah. . . that was a kind of mean thing to do to a 4-month old, eh? SO cute, tho… 😉 She wasn’t thrilled about it, but she behaved like a trooper. I’m so glad I have that memory of her tiny-ness! Saumya: Thanks! 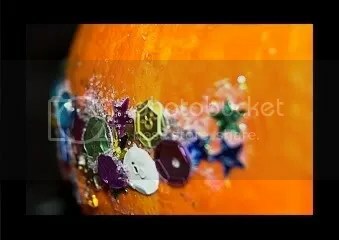 Do you guys carve pumpkins in the UK? So cute!!! And pumpkins can’t be seedless because someone of us are FORCED into cooking up the seeds. I hate roasted pumpkin seeds, but I have been informed by my wonderful-I-can’t-cook husband that I MUST absolutely toast him some seeds. Hmph. Of course, that also means that I am required to do the cleaning of the seeds, but we’ll see. I’m frustrated that we haven’t done this activity yet because I wanted to do it last weekend. It’s on my list for this weekend, though!! YAY for pumpkins!!! It’s SO much fun and the girls are gonna LOVE it! 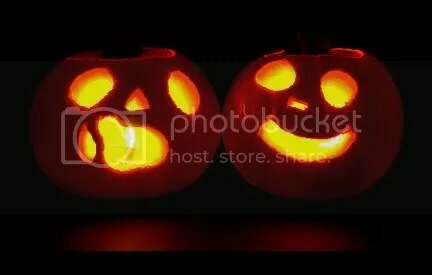 I absolutely ADORE T’s pumpkins and I think she did an awesome job with her scaredy one and her happy one. 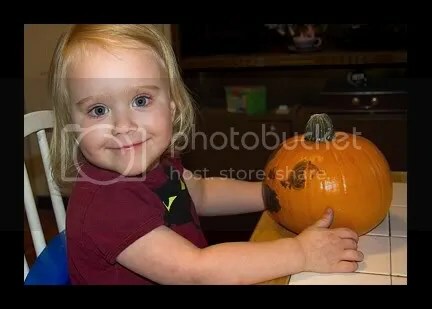 Such an artist, just like her parents!